This year the brand intends to use a new visual hook to pull attendees into their sphere of influence – close to a million automotive enthusiasts are expected to visit the show that begins on September 10 with Press days. This year Audi is claiming the same 3,400 square meter space, but has created an aerial model of a cityscape that hangs down from the ceiling, immersing the Audi aficionado in the environment the sophisticated modern driver must navigate. “In Frankfurt, we will experience an impressive demonstration of what distinguishes an Audi trade fair appearance. Turning expectations upside down, ensuring that 'Wow' effect – with this year's concept, we are taking the next step,” says Luca de Meo, Member of the Board of Management for Sales at AUDI AG. From the outside, the exhibit looks like a cube floating in space over the floor of the Agora, as the plaza in the convention center is known. It rises 13 feet over the surface on a mirrored platform that creates the illusion. Inside a network of cables and LED lighting emits a panoply of sensory inputs, surrounding the viewer in a totally modern urban environment. 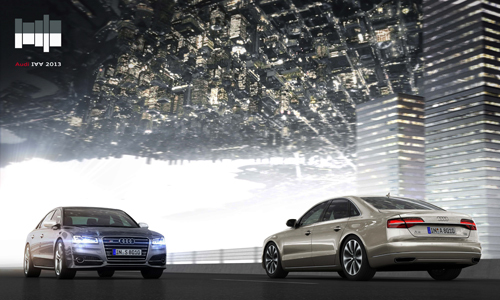 Mirrored elements above and below extend the immersion in the city of today with Audi’s automotive stars creating the balancing point. The Audi pavilion has been under construction since mid-July, during which time approximately 2,300 square meters of mirrored surfaces and 150 kilometers of cable have been placed, making room for 28 automobiles with four overlapping rings – Audi’s 2013 IIA exhibit. The 65th International Motor Show will open in Frankfurt am Main from September 12 to 22. Either be there or save your money for a new Audi – you’re a winner one way or the other.